A great gift idea for craft beer lovers, this 64 oz. 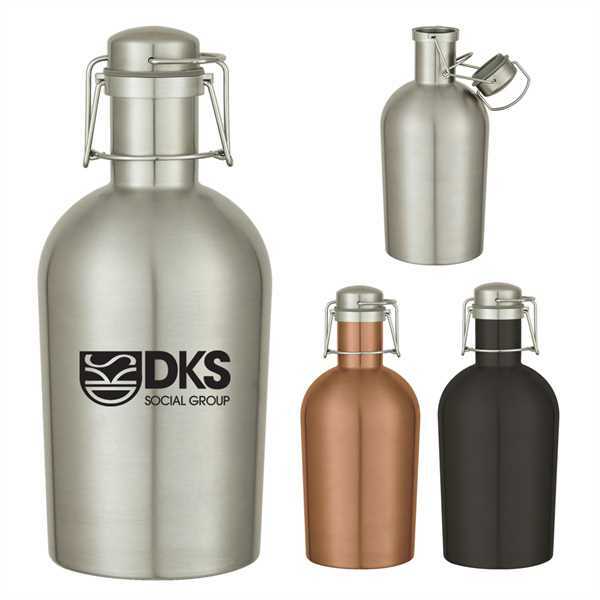 growler is made from durable stainless steel, so it is virtually indestructible! It has a tight seal swing-top lid to keep drinks fresh. Offered in your choice of silver or matte black, you can customize this growler with an imprint of your company name and logo for maximum brand visibility. This product is BPA free and meets FDA requirements. Hand wash recommended. Keep your beverages cold with this elegant marketing tool! Imprint Size:4" x 4", 8" x 4", 2" x 3"